While Federal Reserve Chairman Jerome Powell talks up the strength of the U.S. economy, growth expectations appear to have gotten a little out of hand. Wednesday’s report that GDP increased 2.5 percent in the fourth quarter — a notch lower than first reports — was just the latest indicator that while the economy is still performing well, it’s a far way from blasting off into the stratosphere. One measure, the Citi Economic Surprise Index, shows graphically how economists have been overestimating the expansion. The pace of growth is significant as investors have been sweating over how rapidly Powell and his Fed colleagues will move when it comes to raising interest rates. Markets on Wednesday increased the chances for a fourth rate hike this year. As its name suggests, the index measures actual data against Wall Street estimates. After hitting a nearly seven-year peak in early January, the gauge has cooled off considerably and is at its lowest point since mid-November. Back in late June, the highly cyclical index reached its lowest measure since August 2011. The index has an inconsistent history in terms of its correlation with the stock market, though lately both have been trending lower. The index does not suggest that the economy is falling off a cliff. Its reading of 33.5 indicates that data continue to surprise to the upside, but not nearly as much as earlier this year. While the fourth-quarter GDP reading came in right around expectations, there have been some notable other data misses in February. Domestic auto sales, retail sales excluding autos, multiple housing indicators and durable goods orders all fell short. A continued downtrend could cause economists to start marking down what have been increasingly aggressive forecasts for full-year growth. Many have come around to the Trump administration’s assertions that the combination of tax cuts and increased domestic spending will push GDP considerably higher this year. Most recently, though, the Atlanta Fed slashed its projection for first-quarter growth. 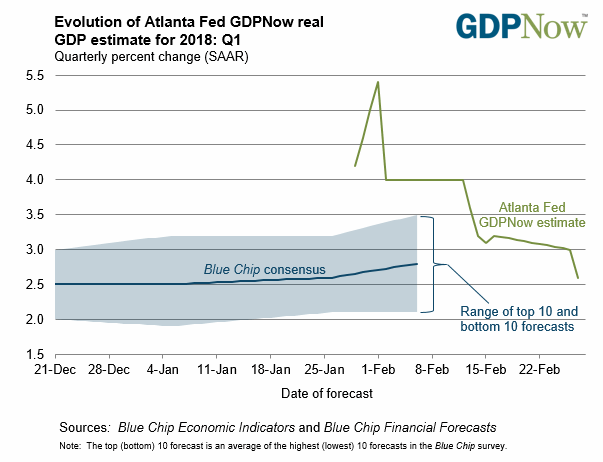 The bank’s widely watched GDPNow tracker drew headlines Feb. 1 when it estimated that the first quarter was moving at a powerful 5.4 percent pace, which would equate to the best quarterly gain since the financial crisis. However, the string of disappointing reports has caused the Atlanta Fed this week to pull its forecast all the way down to 2.6 percent, after the disappointing reports on durable goods orders and advanced economic indicators. Even with the cooling economic data, Fed Chairman Powell told Congress in a speech Tuesday that he is optimistic about growth. 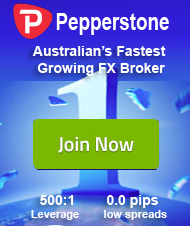 Powell’s enthusiasm even spooked the market some, with the Dow industrials dropping nearly 300 points after traders worried that the new central bank leader might push for faster rate hikes given his views on growth and inflation soon rising to 2 percent. Most economists seem to share his views, despite the recent dip in data compared with expectations. Markets are adjusting their outlook for Fed hikes, with the consensus still forming around three rate increases this year, the first one coming in March. However, the implied chance for a fourth move jumped Wednesday to a new high of 36 percent from 28 percent a week ago, according to the CME’s FedWatch tracker. There’s now even an 8 percent probability for a fifth hike in December. WATCH: Debating the market’s response to Powell’s speech.